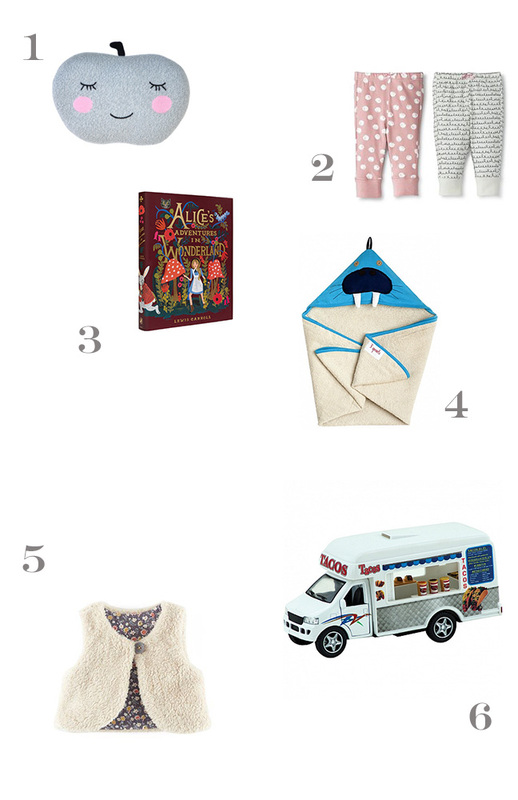 Holiday shopping for kiddos is the most fun type of shopping. It is also way more entertaining to watch a little one rip open their pressies than your weird uncle Larry. Here are a few of our favorite pics for the kiddo in your life. 1. Apple pillow by Blablakids; 2. Pattern leggings at Target; 3. Alice’s Adventures in Wonderland illustrated by Rifle Paper Co; 4. Walrus bath towel found here; 5. Fleece vest by Mini Boden; 6. Taco truck found here.